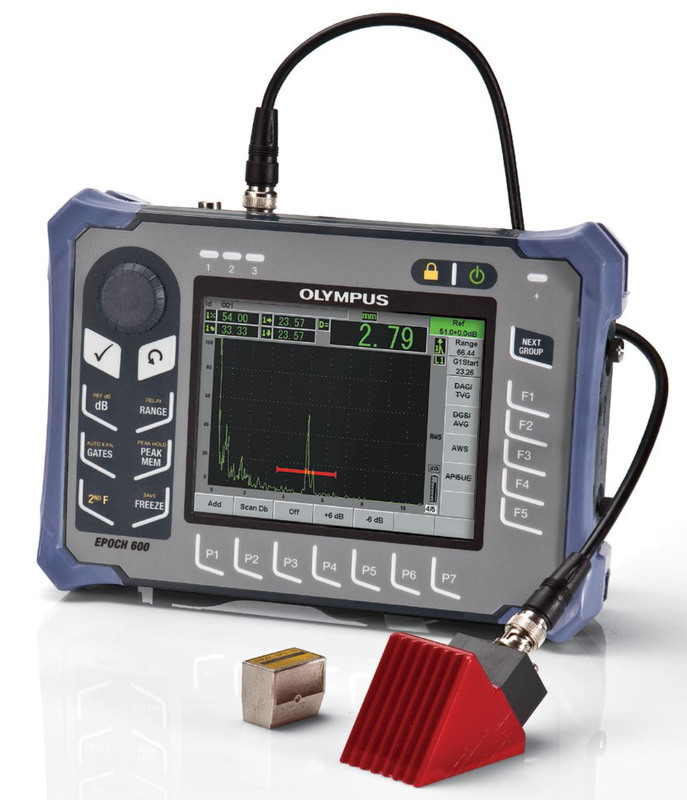 The EPOCH 600 Digital Ultrasonic Flaw Detector combines Olympus industry leading conventional flaw detection capabilities with the efficiency of a highly portable, intuitive instrument. The EPOCH 600 flaw detector’s blend of efficient menus and direct access keys allows you to take advantage of the highest quality flaw detection platform with exceptional ease of use. The large, full VGA transflective display combined with our patent-pending digital high dynamic receiver provides a stable, striking A-scan representation in any lighting condition. Available in two hardware configurations, the EPOCH 600 offers you the choice to adjust parameters with a knob or with a navigation area on the keypad. The EPOCH 600 is designed to meet the requirements of EN12668-1 and allows a full range of standard and optional flaw detection features. The rugged, ergonomic design allows use in nearly any environment, while the flexible PerfectSquare™ pulser and digital filtering capabilities can tackle nearly any application. The EPOCH 600 combines the efficiency of a basic flaw detector with the quality of Olympus’ most powerful fully digital ultrasonic instruments. A full range of dynamic, reliable inspection features are packaged with economy of size and ease of use.This optimal balance brings powerful flaw detection features within reach ofany level of inspector. The EPOCH 600 design is focused on providing a very high level of flaw detection with the simplicity of a basic instrument. The EPOCH 600 is designed to be ergonomic, intuitive, and practical for both experienced and novice ultrasonic inspectors. The EPOCH 600 user interface is based on the industry approved EPOCH 1000 Series imaging flaw detector. The EPOCH 600 combines a simple menu structure for instrument settings, calibration and software feature adjustment, with the EPOCH brand’s hallmark direct-access key approach for critical inspection functions such as gain and gate adjustment, screen freeze, and file save. Supported in multiple languages, the EPOCH 600 user interface is intuitive for any level of operator. The EPOCH 600 is designed for use in nearly any inspection environment, from bench top testing in a laboratory to extreme outdoor and hazardous conditions. Designed for IP rating ineither knob (IP66) or navigation pad (IP67) configurations, and tested to very high environmental and reliability standards,the EPOCH 600 allows users in any inspection environment to feel confident in both the performance and durability of the instrument. The instrument is tested for vibration, shock,explosive atmosphere, and wide temperature ranges, and with a battery life to exceed 12 hours, the EPOCH 600 is the perfect solution for remote inspection locations.